Even among the marvels of the ancient world, the ruined city of Ephesus is unique. While the seven ancient wonders of the world are majestic and singular, Ephesus is astonishing because of its totality, a massive city that at its height had a population of 250,000 citizens of the Roman Empire. It had plumbing, homes with indoor heating, a library that would rival the famous one in Alexandra, an amphitheatre that could sit 24,000 attendees, streets illuminated by oil lamps, and a marmoreal sheen that beckoned sailors into its port on the Aegean Sea. Today, Ephesus is inland by six kilometres — a result of receding waters — and accessible via a highway that brings travelers by the busload to its remains. 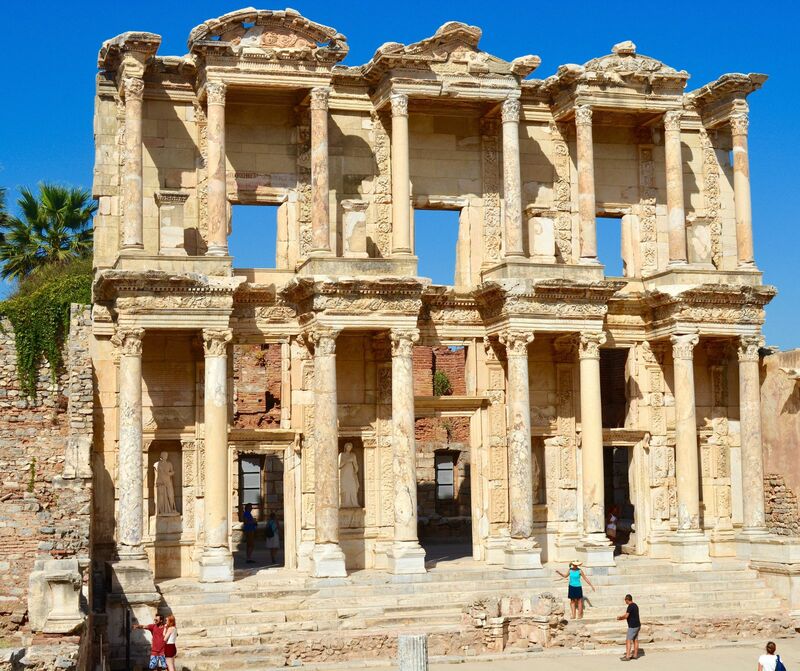 Although the overwhelming majority of what once stood in Ephesus is gone — obliterated by earthquakes, stolen by thieves, or seconded away to museums around the world — the structures still in place are plenty enough to enthral any visitor to this site in southern Turkey. 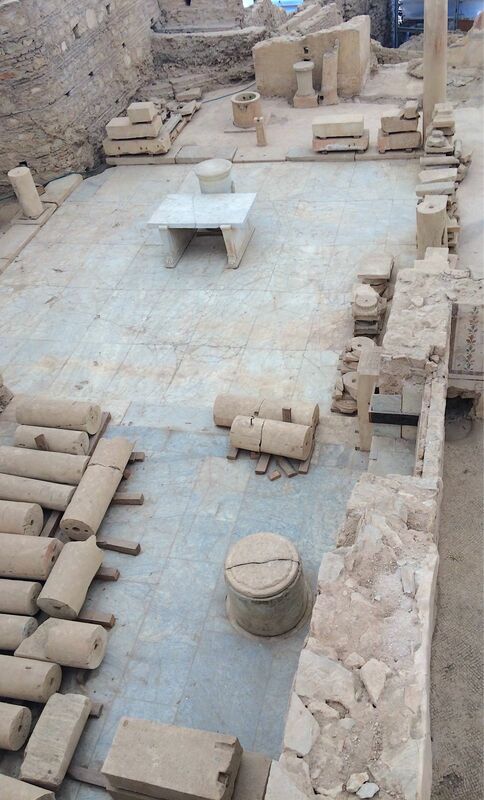 Occurrences in Ephesus helped shape our current civilization, impacting several aspects of our culture. No matter how much you read about a place, there is never any more impactful method of gaining knowledge than through immersing yourself in the subject. So it is with historic locations such as Ephesus and what I learned during my three hours exploring the ruins was the level of the city’s advancement. Ephesus flourished for more than a thousand years, from 400 BCE to 600 CE, and during that time developed into a primary commercial capital of the ancient world. It was a Greek city, then a Persian city, then a Greek city again once Alexander the Great entered it, a Roman capital, and a pivotal location for Christians, who took control of the city in the second century and dramatically changed it. Nicknamed the Marble City, Ephesus was one of the world’s first tourist destinations, attracting merchants, military leaders, and politicians who wanted to see the opulence of the city for themselves. It also drew religious followers. Some wanted to see the Temple of Artemis (or Diana), one of the Seven Ancient Wonders, and the other monuments dedicated to the goddess of war. Increasingly, though, Christians arrived and symbols of their presence are some of the most riveting items you will see in Ephesus. 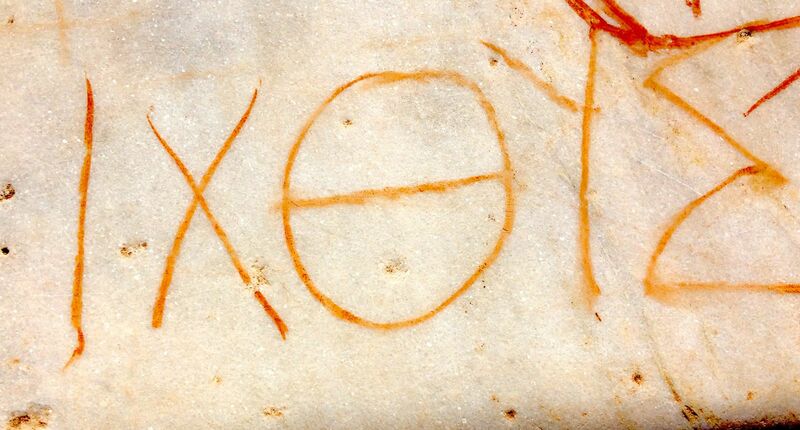 Signs of a fish and five Greek letters that spell a word resembling “Ix0yz” are how Christians venturing into Ephesus would know members of their community lived in the city. As a single word, the “Ix0yz” symbol meant “fish”, but as an acronym it stood for “Jesus is the Son of God and Our Saviour”. Christians would search for one or both symbols as they traveled the ancient world, avoiding persecution as best they could. In Ephesus and other parts of Turkey and Greece, you’ll find many souvenirs with the fish logo, which, like the cross, has become a symbol for Jesus. It was in the name of Jesus that Christian leaders, once in power, dimmed the lights on Ephesus and lowered its stature as a place of intellectual and artistic pursuit. Women, who historically had many of the same rights as men in Ephesus, were stripped of their privileges, and the monuments to Artemis and other goddesses were denigrated, labeled pagan. 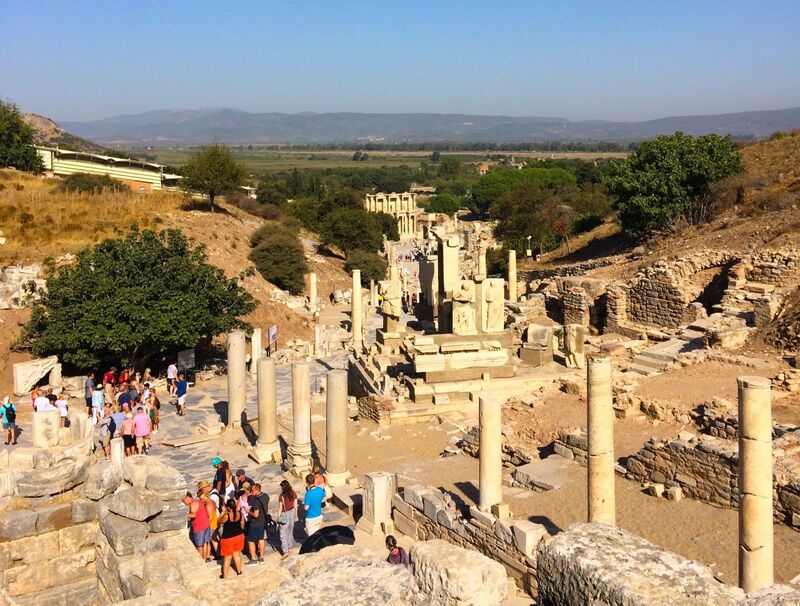 No matter your faith, the historic significance of Ephesus is powerful. It showed how people lived and how they struggled. A select few thrived, too. My visit included a tour of the city’s terrace houses, where ruins have allowed archeologists to piece together furniture and even some homes. The houses featured multiple bedrooms, indoor running water and plumbing, and decorative murals. They belonged to the elite class of Ephesus and were congregated in a location away from the heart of the city, a kind of Central Park East or Beverly Hills for the ancients. During its lifetime, Ephesus was affected and altered by politics, and it continues to be. With political tensions and threats of violence in Turkey at a high, visitation to the site has significantly dropped. As a whole, the nation’s tourism industry saw a loss of more than $3 billion in 2016 and many of the cruise ships that deliver huge numbers of travelers each year have ceased sailing into Kusadasi, the port city that provides access to Ephesus. I journeyed with Celestyal Cruises, which has maintained its sailings and tours to Ephesus. That’s fortunate because the ruined city was phenomenal to visit. Like so much of the great ancient spectacles, Ephesus feels like communal property, a significant part of human history that in some way has impacted each of us. Getting There: It takes about 30 minutes to drive from the port of Kusadasi to the archeological site of Ephesus. Tours with English-speaking guides can be arranged on your cruise ship or in the port, with entry to the archeological site included in the tour price. Tour buses drop passengers off at the entrance of the archeological site and pick them up at the exit. It will take up to four hours to see the site in its entirety. Entry Fee: If you’re entering on your own, admission costs 40 Turkish lira (about $11 USD) per adult, with an additional charge of 20 lira ($5.50 USD) for entrance to the terrace houses. Tips: Bring water and a hat with you because the temperatures will likely be blazingly hot and there is very little shade. Definitely buy a ticket to see the terrace houses — not only are they fascinating to view, but the facility where they are housed is covered, providing a respite from the heat. If you’re keen to shop, plan to spend a few minutes in Kusadasi’s bazaars, where bargains can be found, if you’re okay with haggling on the price. Sailings and Cost: The all-inclusive four-day Iconic Aegean cruise operates from March to October. Rates start at $740 per person for 2018 sailings. The Iconic Aegean is ideal for passengers looking to see the highlights of the Greek Islands and to decide which of them you’d like to base a longer stay. 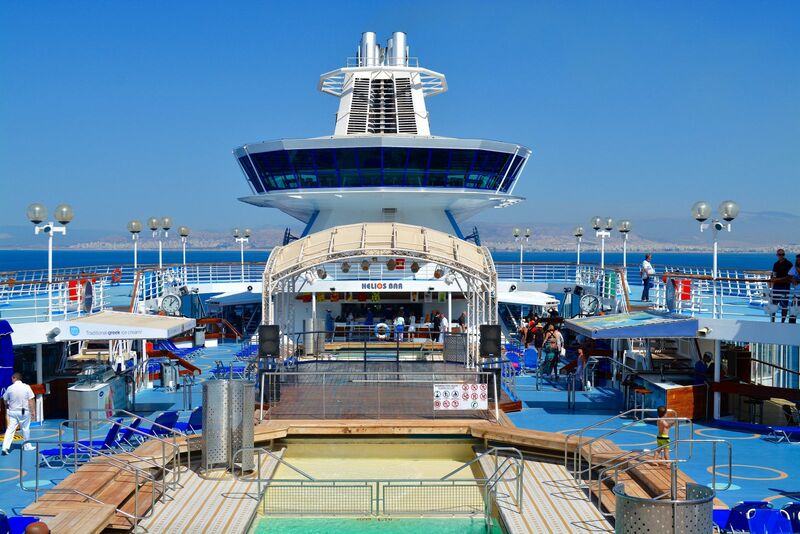 Celestyal offers additional cruises of the Greek Isles as well as Cuba. Mykonos and Santorini Will Light Up Your Vacation — The two iconic Greek Islands are known for romance, sunsets, and incredible beaches. Check out this article as you plan your trip.